Opposition Leader Patrick Pruaitch said today free education has received a fatal budget cut in the 2018 Mid-Year Economic and Fiscal Outlook (MYEFO). He said: “The revised MYEFO budget has slashed funding for the Department of Education by K601.3 million to K275.5 million with K191.2 million to be disbursed in the second half of this year. “If these figures are not urgently revised a major financial crisis will engulf the education system and schools throughout the country with no explanation given by the government for the dramatic cut back in funding. Mr. Pruaitch said no reason was provided for the big cut in education funding. 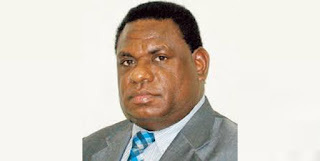 Mr. Pruaitch said it is highly ironical that in the year PNG is playing host to the APEC Summit the only other department to face a budget cut from the 2018 national budget allocation has been the troubled Department of Foreign Affairs and Trade, where funding was cut by K6.4 million to K32.5 million. · Provincial and Local Government Affairs, up K14.6 million to K57.2 million. Mr. Pruaitch said the public at large would continue to suffer from the double standards and economic mismanagement of the O’Neill-Abel Government. “The massive government borrowing in the past five years has pushed debt servicing costs beyond K2 billion for the first time, the equivalent payment of K250 annually for every man, woman and child in this country.